Isn't he cute? 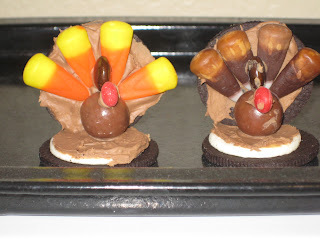 We make these every year for Thanksgiving. It's a great kid craft and they can eat it after they are done admiring their work! 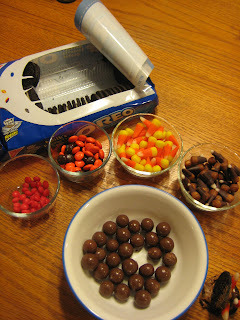 Try experimenting with different candies. 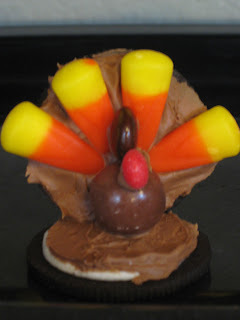 They have different colored candy corns that give you a variety of feathers to choose for your turkey. Have fun and Happy Thanksgiving! We are moving into a new house across town this weekend, so my posting may be delayed for a little bit....I'll be back as soon as all my crafting and baking supplies are unpacked again! MY GOODNESS!!!!! I thought I had been all caught up on friends blogs but then I remembered something, THIS BLOG! I went as far back to the pumpkin tie dye shirts. Britt, seriously, I love this blog. You have so many great ideas, thank you for them all. I want to try the twilight shirt idea someday......the short bread looks great, uh.....and pretty much EVERYTHING else. I need to start a file in the filing cabinet on GREAT IDEAS.